Tennessee Ernie Ford was a radio DJ and singer in California in the post-war years who signed to Capitol and over the next decade scored a string of 30 country and pop hits in the USA as well as becoming extremely popular in the UK, becoming a ubiquitous figure on American radio and TV over subsequent decades. He achieved three memorable country No. 1s in the USA with “Mule Train”, “Shotgun Boogie” and the iconic “Sixteen Tons” which was a pop No. 1 in both the USA and UK, as well as making the pop Top 3 on both sides of the Atlantic with “The Ballad Of Davy Crockett”. 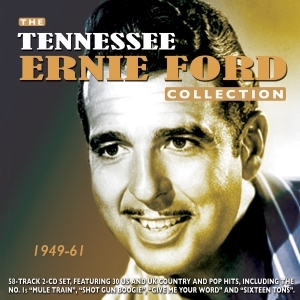 This great value 58-track 2-CD set comprises all his charting A and B sides released from his 1951 debut through to 1962, by which time he had scored his last pop chart entry, along with most of his other A sides and selected B sides, and it brings together the boogie-flavoured material from his early years with the crossover hits from mid-decade and some of the later releases where he moved towards gospel styles, as well as his duets with top female artists like Kay Starr, Helen O’Connell, Betty Hutton and Ella Mae Morse. It’s an excellent showcase for his distinctive voice as well as his the versatility which enabled him to span the breadth of country styles and achieve major international popularity.